Remastered LP Reiussue! Originally released in 2007. LP package is single jacket + printed sleeve + foil stamp + black vinyl + code for full album download. Recorded by Mark Nevers (Lambchop) at the Beech House in Nashville, Tennessee. Drawing, collage & painting by Alasdair MacLean. After The Clientele released Minotaur, Alasdair MacLean, singer and principal songwriter for the band, made two wonderful albums with Lupe Nunez-Fernandez as Amor de Dias, issued a Clientele best-of called Alone and Unreal, oversaw reissues of Suburban Light and Strange Geometry, and played shows solo or as part of Amor de Dias or The Clientele. He and Lupe have also been raising a family, so the prospect of a new Clientele record seemed to be diminishing.It seems fitting, then, that a chance meeting with a ghost from the past/future is what led to Music for the Age of Miracles, the first album of new Clientele songs in seven years. Theres something rapturous about the ways in which tracks on side one such as "Falling Asleep" (featuring the Santoor) and the exquisite "Everything You See Tonight Is Different From Itself" stretch out in choral harmony and rhythmic syncopation. Leon Beckenhams trumpet solo on the latter is a highlight of the record, as is the way the words "ballerina, breathe" reappear at the three-minute mark. Similarly, Keens beautifully evocative interludes "Lyra in April," "Lyra in October," and "North Circular Days," the last of these featuring a recording of the wind captured outside the late filmmaker Derek Jarmans house in Dungeness on the Kent coast, mean this album sounds subtly but significantly different from previous ones. Birth, rebirth, the ghost in the trees, something on the edge of sight, the faces we love, childhood, parenthood, the dance of our days; music for the age of miracles, indeed. 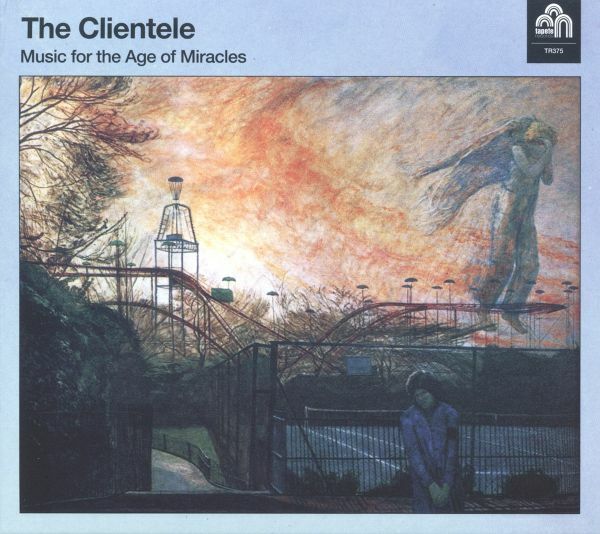 Originally released in 2005, The Clientele recorded their 2nd full-length album Strange Geometry with producer Brian O'Shaughnessy at Bark Studios, Walthamstow (UK). The album features twelve dreamy folk-pop songs with shimmering psych guitars and string arrangements by Louis Phillippe. The Strange Geometry vinyl repress includes a full album download, plus a six track digital-only bonus download of songs previously unreleased. Strange Geometry was the first Clientele album to be recorded in a fully equipped, professional studio with an established engineer/producer. The results are stunning. Strange Geometry is a robust yet subtle recording. Songs are allowed room to breathe, yet never stray into indulgence.